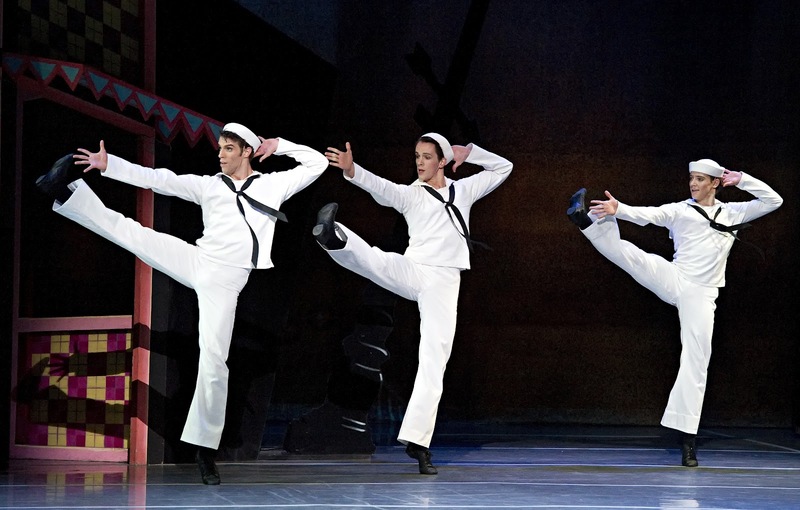 James Whiteside, Paul Craig and Isaac Akiba kick up their heels in Fancy Free. Photos: Gene Schiavone. It's actually rare that a Boston Ballet program doesn't hang together thematically, but, well, the current Fancy Free (through this weekend at the Opera House) lives up to its moniker; it's a little bit of this, and little bit of that, thrown together fancy-free; most of it's good, some of it's great, and some of it kind of misfires. You leave it happy, but a little confused. But that's okay - there's certainly no confusion about the fact that we've been overdue to see Fancy Free, the seminal Jerome Robbins/Leonard Bernstein portrait of three sailors on leave that became the springboard for On the Town (and its subsequent Hollywood incarnation with Gene Kelly), which has long since worked its way into the national consciousness as a central cultural trope of World War II - even though ironically enough, the Jewish Robbins and Bernstein (Robbins was born Rabinowitz), both avoided military service during the fight against the Nazis. 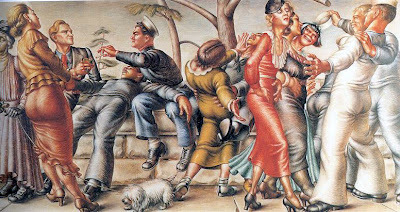 Other ironies cling to Fancy Free; it was inspired by gay artist Paul Cadmus' notorious The Fleet's In! (below), a painting funded by the WPA which had to be withdrawn from public view due to the apparent sexual aggression of its subjects (who, it seems, swing both ways - note the sailors sprawled together on the left). The gay Robbins, who was far more determined than the bisexual Bernstein to keep himself in the closet, quietly deleted the work's homosexual subtext, however, explaining some years later that "I wanted to show that the boys in the service are healthy, vital boys: there is nothing sordid or morbid about them." Okay, count me in as sordid and morbid - and the long arc of The Fleet's In! is probably an archetype of how art is processed into pop in this country; but, you know - whatever. At any rate, Robbins left the hetero-sexual harassment angle in, that's for sure (although even this was toned down over time, until in the Gene Kelly vehicle it's actually the women who are the happy aggressors). On its own terms, of course, Fancy Free remains a lark that still spreads bold wings against a dark, empty sky; to the tune of Bernstein's structured "jazz," Robbins' boys fight as much as they flirt, and they float in a kind of desolate urban void, seemingly populated only by the occasional lonely woman (and a bartender straight outta Edward Hopper). On opening night, this trio included two of the Ballet's strongest athletes, Isaac Akiba and James Whiteside, who were hanging with the up-and-coming Paul Craig (at top). Akiba channeled his usual eagerness to dazzle into a galvanizing solo, nailing the work's most difficult moment (multiple tours that fall into full splits). Whiteside, meanwhile, was slyer - one brow was always cocked, the other eye always winking - and delivered a witty, booty-shaking turn as the little clique's class clown. But Craig was the surprise, once again displaying a smooth technique and a subtler set of acting chops than most dancers his age; his sailor was the guarded, knowing romantic, the guy who might be able to offer a girl more than a five-minute roll in the hay. As said girls, the reliable Erica Cornejo and Kathleen Breen Combes lit up the stage with fire and smarts, respectively, before they finally fled their uncontrollable suitors - and another up-and-comer, Brittany Summer, then made hilarious comic hay out of a cameo as their next target. The rest of the program intermittently held to this high standard. In the evening's first offering, in fact, Peter Martins' Barber Violin Concerto, the dancers themselves were superb, it was the work itself that seemed slight. Martins offers two couples, one apparently "classic" (she's in toe shoes), the other "modern" (he's bare-chested, both are bare-footed) who first have their own variations, then switch partners, to the accompaniment of Barber's lovely, vaguely modernist concerto. The idea seems to be a dryly affectionate parody of the conflicted intersection of the modern and the classic; over the course of the dance, the ballerina lets down her hair (! ), while the "modern" woman does everything she can to distract her calm, classical consort. This isn't quite enough to fuel an entire dance, though (it ends suddenly), and several gambits play a bit oddly (or ironically?) against the smooth lyricism of the Barber - still, the work often has a pleasing grace. Lia Cirio and Pavel Gurevich (at right) were appropriately elegant and remote as the classicists, while Yury Yanowsky and Sylvia Deaton threw sparks as the brutal modernists. Deaton, who has long lit up the corps and small featured roles, proved a particularly appealing free spirit - she grabbed her big chance with both hands, in a night of young turks taking turns in the spotlight, and perhaps made the biggest splash of all. If the Martins seemed only lightly connected to the Robbins, however, the concluding dance, Harald Lander's Études (to an elaborate orchestration of Czerny's familiar piano exercises) felt like a puzzling non sequitur. Perhaps the idea was to focus on the corps itself after so many cameos by its former denizens; I don't know. The idea of the piece is clearly to build from simple exercises to ever-grander choreographic structures, in what can only be called coordinated group solos. This has some formal interest, I admit - it's at its most effective at its most mechanical, in a few silhouetted sections (at left). But the development gets repetitive, and at times seems like a big in-joke on what some people think of as "ballet" (you know the type - the ones who insist on an elaborate descriptive vocabulary in French). And in the end, there's only reason to program Études, and that is if you've got a company that works like clockwork. And alas, as deep as the Ballet's bench currently is, at least on opening night there were a few slips, both from the corps and the soloists. Still, as the Ballerina with a capital B, Misa Kuranaga was her usual perfect self, and Jeffrey Cirio and Paulo Arrais, the company's current junior stars, wrapped things up with a dazzling technical duel. It got so competitive, in fact, that Arrais wobbled at one point - but I may have preferred that moment of real, human drama to the some of the robotic virtuosity that had come before.